With all of the benefits of a vegetarian diet, many people are choosing to try a few new things. Especially for kidney disease patients, a vegetarian diet can be extremely beneficial to help lessen uncomfortable symptoms and even potentially slow the progression of kidney disease. To help you start your new healthier diet, you might need a few tips. 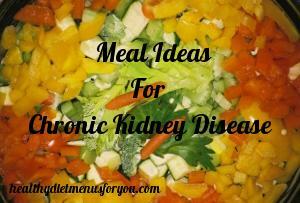 Here is how to create a vegetarian meal for your kidney disease patients. 2 carbohydrate choices: Such as white bread, toast, oatmeal, cream of wheat, cereal, or muffin. 1 fruit: Such as one serving of fruit from a can, one apple, or half a banana. 1 fat or sweet: Such as margarine, jelly, or honey. Example: One cup of cream of wheat hot cereal topped with one cup of mixed berries and one tablespoon of honey. One serving of fruit or raw vegetable. Depending on your protein restrictions you might pair with one tablespoon of peanut butter, hummus, or dressing. 1 protein option: Such as one egg, egg white, or egg substitute. Or one serving of meat analog. Or one serving of peanut butter or other nut butter. 2 carbohydrate choices: Such as two slices of bread, one serving of rice or noodles. Example: Tossed salad with one crumbled hard-boiled egg, chopped red peppers, onions, cauliflower, carrot and cucumber. Dress with one tablespoon of olive oil mixed with garlic and ½ tablespoon Dijon mustard. OR Two slices of white bread with peanut butter served with one sliced apple and a handful of baby carrots. One serving of unsalted pretzels with mustard. 2-3 ounces of protein: Such as eggs, tofu, seitan (wheat protein), veggie burger, other meat analogs. Example: Steamed rice topped with stir fry tofu and veggies sautéed with one tablespoon sesame oil and one tablespoon low sodium soy sauce. One serving of fruit sorbet, one small slice of apple or berry pie, or a baked apple with brown sugar and cinnamon. As with any diet, keep your eye on your protein and potassium intake. Many people are under the assumption that vegetarian diets are low in protein, but that is actually not the case. In fact, plant based protein is more easily absorbed by the body. It is also more easily processed by the body, which is good for kidney disease patients, but you still have to watch your protein intake. A vegetarian diet is not difficult, and can be quite delicious, not to mention all of the health benefits especially for kidney disease patients. Of course, you should always speak to your doctor and nutrition counselors before making changes to your diet. They will be able to give you a better idea of what is right for you specifically and what foods to watch out for. Being on a kidney diet is hard, and when you only eat certain foods it can be harder. I hope this helped you to be able to create a vegetarian meal for kidney disease and for more information check out my other blogs.